If you want to eat healthier to lose weight and feel better, you’d better have a plan. Without any guidelines about what foods are good to eat, what foods to avoid, about how much you should be eating, and a plan to make the logistics of sourcing healthy food work, chances are you won’t get far. This is nutrition 101. But sometimes, fewer rules are better. A lot better. 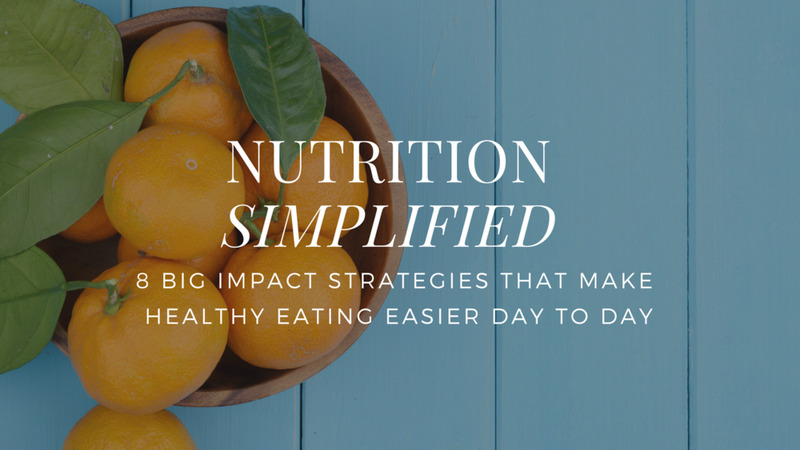 I know it sounds completely nonsensical, but in some cases fewer restrictions about what to eat can actually make your eating healthier. This is true when you’re starting out on a diet. As it turns out, not being too restrictive can streamline the process of improving our eating habits, and help to make implementing those changes feel less daunting. Loosening up on restrictions can also be beneficial when you’re mid-way through your nutrition plan. Let me give you an example from a client I’ve been working with. I’ll call her Sheila. For the first six months of Sheila’s diet plan, things went great. Her motivation was high. Even with a very conservative, easy to follow plan, the weight was flying off. It was high fives all around! As is always expected when it comes to weight loss, Sheila had a few ups and downs along the way. But during our weekly meetings we’d troubleshoot any bad habits that crept back in. After all, course correcting is a normal part of any change. We were both proud of how Sheila overcame obstacles to stay consistent. But at a certain point, it became more and more of a struggle to get back on track when things went offline. While at the beginning we were cruising along making steady process and life was good, now her diet felt like pushing a car up a hill. As Sheila’s consistency with the plan suddenly plummeted, predictably so did her results. Instead of losing pounds like a bad habit, we were gaining some back. Most people who’ve tried to lose weight before have hit this point. Things go well until they don’t. And then everything starts to crumble and you end up right back where you started. That’s probably the #1 fear of people who’ve been down that road multiple times: the assumption that you’ll inevitable fall back into old habits, relinquish all the progress that you’ve made, and render all the hard work you did up to that point meaningless. As soon as things get a little tricky it’s easy to think: “Oh god, it’s happening again. I’m failing again.” This can become a self-fulfilling prophesy. As Sheila’s momentum slowed, so too did her motivation. After all, if things are getting tough and you’re expecting to eventually fail anyway, it’s pretty easy to want to pack it in and give up. Yet at the same time, Sheila started her diet and weight loss plan for a reason. A strong reason. She’d already made clear progress over months of dedication. We both wanted her to fight back and make it right. Well, over the course of a month we tried a lot of techniques! That didn’t have much impact. Then we worked on improving planning to make eating healthier as easy as possible, and talked about simple snacks and back-up meal options to fall back on if plan-A got wiped out. It helped a bit, but there was still no breakthrough. We also did some visualisation drills in the morning. They helped refocus Sheila’s mind on the reasons she started this in the first place. They let her actually experience how good it will feel once she accomplished the goal. In addition, we also tried various other “state priming” techniques to get in the right head-space at the start of the day. People from Tony Robbins to Navy Seal Admiral McRaven have successfully used these kinds of routines to develop focus, a feeling of success, and a positive mindset at the start of each day. These methods can involve anything from doing 10-20 push-ups (recommended by Tim Ferris), to making your bed, to doing a breathing exercise, to kicking off the day with a healthy breakfast, to listening to something that pumps you up (a motivational pod cast, Don Cherry’s Rock ‘Em Sock ‘Em 5, the FREEEEEDDDOOOOOM scene in Braveheart, or whatever gets your blood pumping). The goal is first to get your mind right, and second to achieve a small win by ticking something productive off your to-do list first thing. That sets up positive momentum for the rest of the day. The idea is that if you’ve gone to the trouble of having a great breakfast and you’ve done a mini-workout, you’ll be more likely to stay focused and have a healthier lunch. Sheila didn’t fully buy into this stuff and it didn’t have the effect of pushing her up over the obstacle. We were still stuck in a slow backslide. We were running out of options. And even worse, Sheila was developing an increasingly negative relationship to her nutrition plan. She felt oppressed by the rules (which had at one time felt easy-breezy). She also felt tremendous guilt and shame when she didn’t follow those same rules and she’d beat herself up every time she made another “stupid” eating decision. Literally everything about it felt like a tornado of spiralling negativity. Needless to say, that’s not a tried and true path to lasting success! Over the previous couple of weeks, Sheila and I had talked a little about life stress and how she had a lot going on personally. This time we got into specifics. This stress wasn’t just “I’m really slammed at work until my project finishes in a few weeks”. Rather, it was one of those major life stresses that seems to have no end. By understanding this, I was able to completely change our approach. You see, Sheila still wanted to be healthy, but in crisis management mode, priorities shift. Whether it’s a serious relationship issue, financial trouble, or a scary health concern, stresses like these can gobble up all of our attention and all of our energy. No matter how much you want to lose weight, if your survival and lifestyle comes under threat, that instantly becomes priority number one, two and three. We each only have so much bandwidth. I remember my busy friend Kim telling me that “you can’t do everything in your life at 100% at the same time” and that’s absolutely right. For now, we’re not trying to improve. We’re just trying to maintain. She was already way ahead of where she started, so if she could get through this rough patch without sliding back too much, that would be a huge win. Focus on a decent breakfast and lunch (which logistically felt easy for her, so stress was minimal) and anything goes for dinner. Give yourself some compassion and see the bigger picture. Don’t sweat the small stuff. Just try for a solid B- grade on your eating. This new approach allowed Sheila to stop stressing about eating and feeling like everything she did was a total disaster. She was actually able to succeed at the plan, leading to a better mentality and a feeling that she was doing OK with her food. By letting go of some rules she actually started doing better overall including at dinner, which wasn’t even in the plan. What’s more, she started seeing some modest progress again, which was a nice bonus. When your nutrition plan starts going off the rails, make sure you take the bigger picture of your life into account and make adjustments. Sometimes the fix is easy. Sometimes the various approaches that ended up not working for Sheila work well. Other times, they don’t. When that happens, sometimes you need to hit the re-set on your expectations of progress, your short-term goals, and on the rules that you’re following. If your priorities have shifted, you can’t expect to put the same amount of effort into your nutrition plan. But when we can align priorities with a plan that matches them, you can get back on track. If you feel stuck, consider asking for help and get a plan that you feel confident in.